In our tour of Alliance Day 2010 presentations, we now focus on the Search Engine Optimization presentation given by Lauren Moler, who works on the web team at National Instruments. She discussed SEO, and how you can build a program around search optimization to increase traffic, and thus leads, to your website. Search Engine Optimization, or SEO, is the process of driving more traffic to your site through organic search results. Organic results are not paid for and are found on the center of the Google results page. As opposed to SEM, which stands for Search Engine Marketing, and is the process of driving traffic to your site through paid results or advertisements. These results are found on the right or top of the results page. SEO is typically seen as more credible as it is not paid for, but it can take quite a bit of time to optimize your content for search and start showing up at the top of the results. SEM, by contrast, is pretty quick. You can pay for an ad and be showing up the next day when someone types in the word. Ni.com gets about 15 times more traffic from SEO than we do from SEM. Imagine that the web is like the network of stops in a subway station. If I’m going to see a city, I have to travel the subway line and get off at each stop to look around. Instead of sending out a person to explore the web, Google sends out a bot. A bot is a software application used to find your content. And the best subway line the bot can use on the web is links. So the bot moves from page to page through links in order to find your content. This means if you don’t link to a page, Google will never find it. Once the bot finds these pages, they have to look at the content on the page and index it into file which can be recalled when you are searching for a term. Since Google sends a bot instead of a human to explore your website and read the content, it’s important to think about what the bot sees. 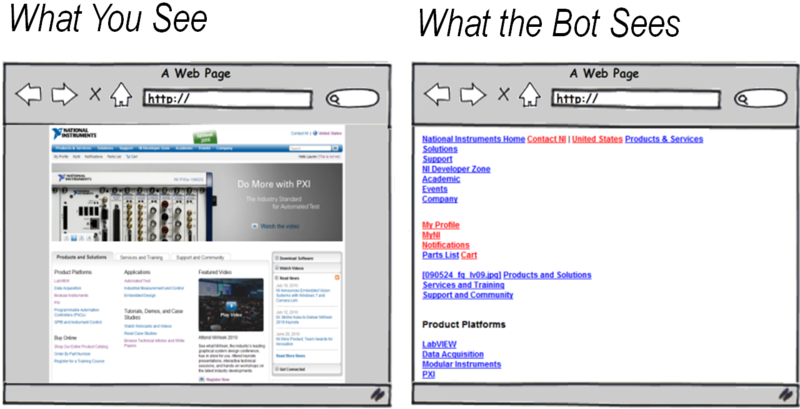 When a Bot goes to ni.com, this is what it sees. It sees the HTML that is used to build the page. We saw this great video full of rich content. All the bot can see is a file path pointing to the video on our server. The only thing it can use to tell what the video is about is the descriptive text underneath it. The main way that Google determines relevancy to a page is through something called anchor text or link text. Anchor text is the visible, clickable text in a hyperlink. Google assumes that this anchor text is descriptive of the page you are linking to. You want this anchor text to match as closely as possible to the keyword you are trying to optimize. Since it’s a software application and not a bot that’s reading your content, you should make sure the anchor text matches your keywords as closely as possible. Finally, Google ranks the results based on importance. Google determines importance based on popularity and the quality of your popularity. At the end of the day Google is trying to reward good content, so it assumes that popular content is deemed good by users. Google puts more weight on pages with a trusted reputation, such as .govs, .edus, and user-generated content like blogs or forums. In the search world, this means that if someone links from a .edu to a blog, and that blog links to ni.com, that Google “juice” will flow all the way up to ni.com. This week, we continue to describe the 5 highest marketing priorities according to TREW Marketing, a full services marketing firm that focuses specifically on engineering and scientific companies, who gave a great session on Alliance Day. Natural relevancy – is the search engines own ability to identify and rank the content from your web site. Basically, you are looking for ways to optimize the content on your web site including metatags, page and section titles, even your web address. You can also improve your ranking by having your content linked to from other site (e.g. ni.com). Pay-per-click advertising – again there is a lot of material out there on this topic. It starts by picking good keywords. More likely a combination of key words that narrows the respondents to those that would legitimately be interested in your products and services. There are entire presentations on this topic (including one given on Alliance Day). I’ll try to summarize the content from that session in an upcoming blog post. National Instrument provides a number of ways for Alliance Partners to marketing their products, systems, and services. Yet, over 70% of those surveyed do not believe that they are taking full advantage of these opportunities. The Alliance Directory – This is the central repository for information about Alliance Partners and their products systems and services. For more information on how to keep it up to date, click here. 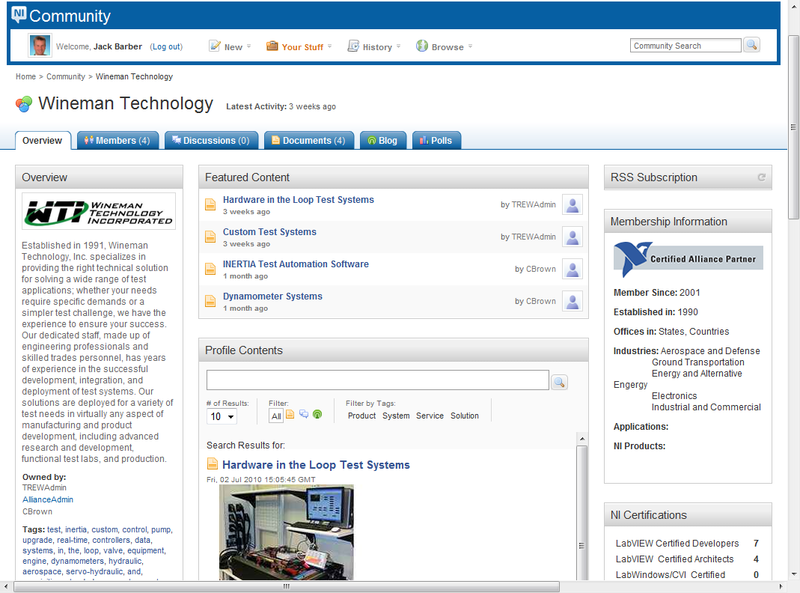 New Community Tools – At NIWeek, NI announced new tools in our on-line NI Community that greatly enhance Alliance Partners capabilities to promote themselves on ni.com. By creating a ‘group’ for their company, they can add ‘documents’ for their complementary products, systems, services and solutions. Unlike using the current Alliance Directory profiles (which are limited to text descriptions), Alliance Partners can add graphics, videos, pdfs, and examples to enhance their descriptions. NI Campaigns and Product Marketing – Of course, NI has its own marketing campaigns and activities. So, if you can help extend NI’s platforms or demonstrate how their use in customer solutions, then may be interested in highlighting your content. TREW Marketing recommends that you build relationships with the key stakeholders for those business areas. And be ‘marketing-ready’ if NI shows interest. Last, but not least, TREW Marketing recommends that Alliance Partners use an e-newsletter to nurture leads for the long-term. By staying in regular contact with your customers, you can stay on the top of their minds. And by going electronic, you can drive them back to your web site to leverage existing content as well as measure traffic and response. 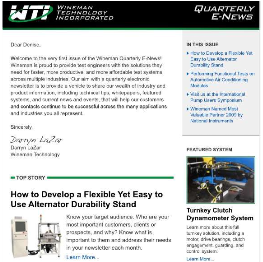 Similar to design concepts for your web site, your e-newletter should have a clean design, headings that grab your attention, and concise content with links for more information. Thanks again to our friends at TREW Marketing for sharing their insights. If you would like further information about their presentation or assistance with your own marketing efforts, contact them at trewmarketing.com. Clean navigation – Make sure that users can easily navigate your site. For instance, don’t clutter your home page with lots of text. Instead, use navigation bars and links to make content easily accessible. Clear, tight content –See more in #2. 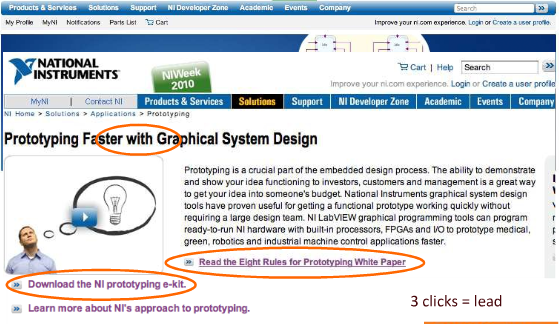 Engaging visitors – After providing the user with a short explanation, give them the option to download a white paper, article, or datasheet for more information. Quality not quantity – Work hard to keep your content concise. In general headlines should be short and text on a page kept to a paragraph or two. Customer testimonials – Case studies and customer quotes are always effective at building confidence of your prospects. Re-use – Take advantage of content that you are creating for customer proposals, events, …. For instance, make a video of a tradeshow demonstration or a customer application and use it as content on your web site. I’ll summarize the tips 3-5 from TREW Marketing next week. Well, after nearly a perfect track record of recording a blog post every week, NIWeek finally snapped my string. While it was on my mind to get something out last Tuesday, my mind was a blur with information overload (and perhaps too many drinks at the evening activities). Nonetheless, I’ve gathered enough insights from the various sessions that I should have enough fodder for this blog in the coming weeks. Here’s a quick recap of Alliance Day. Alex Davern, our CFO, and Pete Zogas, our Sr. VP of Sales/Marketing, did their usual great job of explaining our business strategies. Alex talked about how our strategic plan had allowed us to continue to invest in R&D and our sales organization throughout the downturn, so we are in even a better competitive position as the economy recovers. Regional Partner Manager – Rob Reichmeider, …. The rest of the day was packed with sessions designed specifically for our Alliance Partners. As mentioned in my last post, there were product sessions about you can use them to win more business and training on our latest architectures to facilitate your development. But, given the nature of this blog (and my own interests), I’ll stick mostly to the business empowerment sessions offer insights and information on running your business, improving your marketing, and more. In the coming weeks, I’ll relay information from several of those sessions. Of course, that will pail in comparison hearing it directly. So, make plans to attend NIWeek next year! 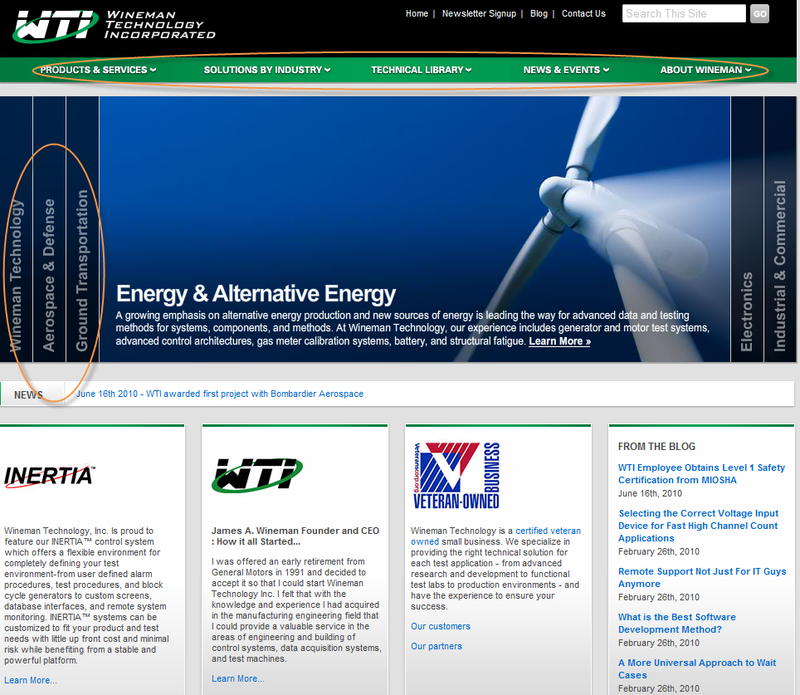 You are currently browsing the Building Stronger Partners Blog blog archives for August, 2010.